Countless books and articles have been written about Rembrandt’s Company of District II commanded by Captain Frans Banninck Cocq of 1642, known today as the Night Watch, but in spite of this its many complexities have still not been fully addressed or understood. I certainly do not pretend in any way to provide the ultimate answer. The painting has had mixed receptions in the past and even in the present: Ernst van de Wetering, at the time of the exhibition Rembrandt, Quest of a Genius in 2006, suggested that the painting was “an experiment gone wrong”, for example. It was architect Pierre Cuypers who, in his design for the Rijksmuseum (1880s), elevated the painting to its present day status: by designing the museum as a cathedral of art with the Night Watch on its high altar the painting became a national symbol rather than a painting in its own right. It has become a “must see” but for reasons that would have been alien to Rembrandt and the civic guards portrayed in it. 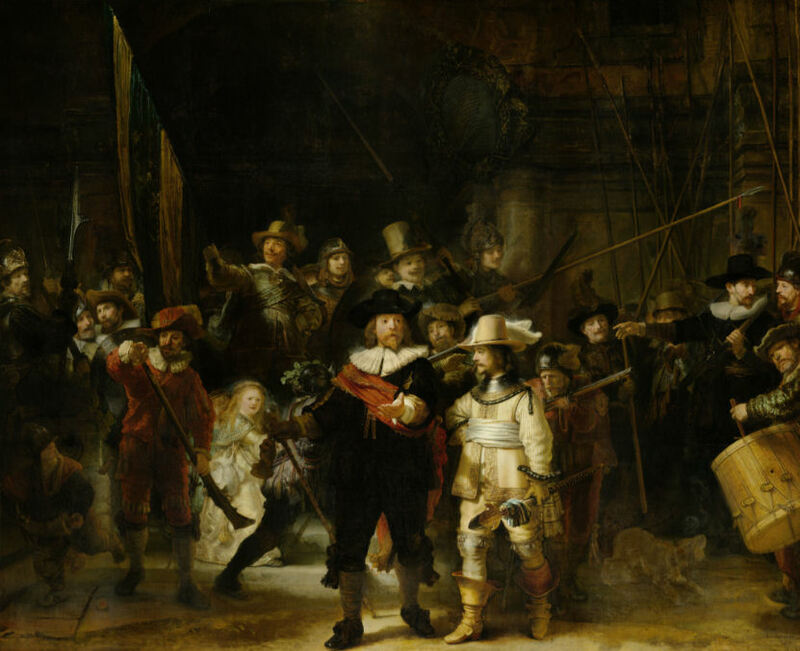 Following the two posts on the history of Amsterdam’s civic guards group portraits, I offer an opportunity to look at the Night Watch within an unusual context. What do the French Queen Marie de’ Medici and Rembrandt’s iconic civic guards painting have in common? At first glance, absolutely nothing of course. But what if the French Queen’s controversial 1638 visit to Amsterdam influenced both the commission and the composition of Rembrandt’s masterpiece? An investigation. In the first post on Amsterdam’s civic guards paintings, we left the Kloveniers (the riflemen’s civic guards company, so named after their rifle, the “klover”) in their cramped medieval tower Swijgh Utrecht with adjacent rickety annex overlooking the Amstel River while the other two companies, the Crossbowmen and the Longbowmen enjoyed the luxury of far grander headquarters on the Singel (the Voetboogdoelen and the Handboogdoelen). We saw that the city’s expansion between 1578 to 1665, which effectively meant an increase in population and, as the number of districts patrolled by the guards grew, an increasing number of civic guards, still divided over the three original companies. It is estimated that at the height of the civic guards, some 10,000 men were members of one of the three civic guard companies, but few of them had the means or the status to be immortalised in the companies’ group portraits. The Kloveniers headquarters soon became too cramped to accommodate its members and guests in any comfort and a grand extension was built next to the medieval tower, overlooking the Amstel River. 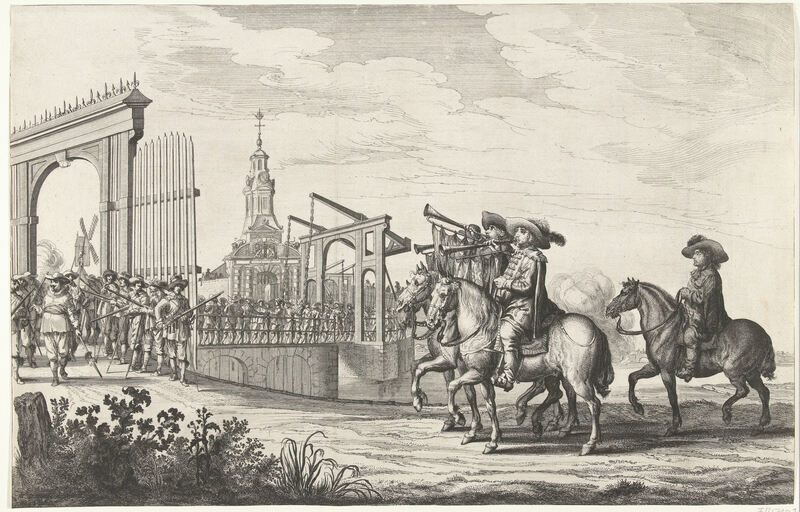 One of the theories concerning the date of origin of the Kloveniers extension is that its construction was triggered by Marie de’ Medici’s visit to Amsterdam in 1638. 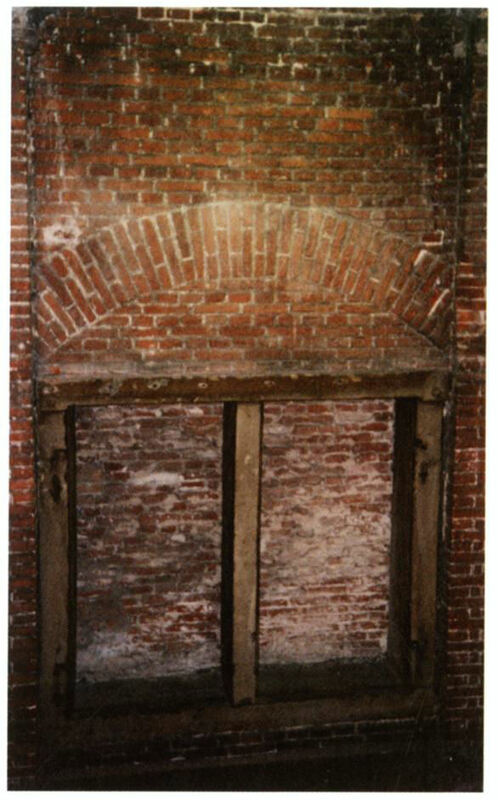 This theory dates the extension to 1638 or 1639 but there are indications that it was built at least a decade earlier. For instance, it appears that the city council, which was accustomed to holding official banquets at the Kloveniersdoelen on a regular basis, did not dine there between 1625 and 1627, an indication that the new extension may have been constructed during those years. 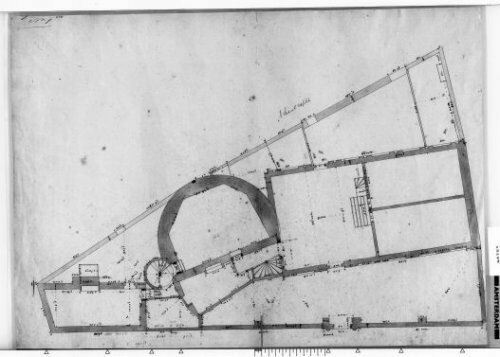 Moreover, a document of 19 December 1630 refers to “the newly built quarters of the Doelen with vacant lots in front and behind” and the new building is also marked on a plan of 1627 for a new sewer for the hospital. It seems safe to assume, therefore, that the Kloveniers‘ new headquarters were completed in 1627. 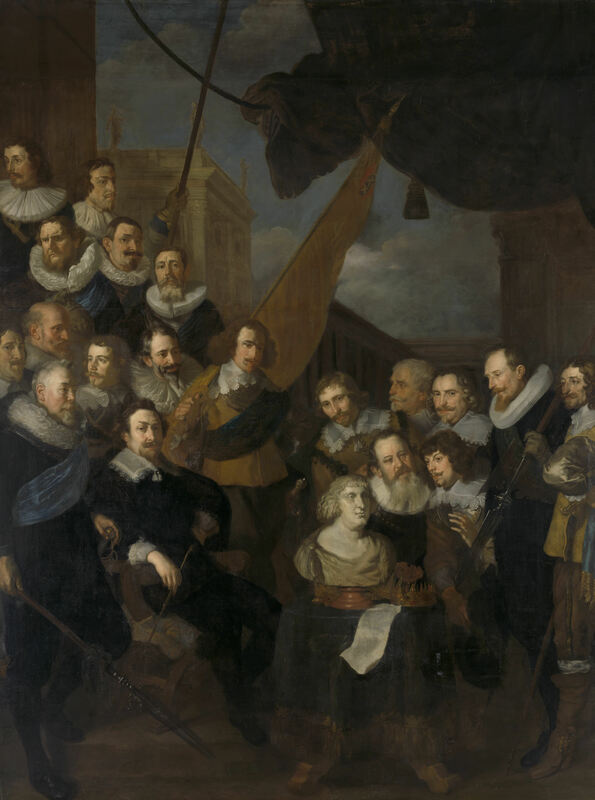 Additional, although circumstantial, proof of this is the fact that soon after its completion the old tradition of militia group portraits was revived with the commission of a group portrait from Thomas de Keyser (dated 1632). After all, to be able to commission large paintings, one needs room to hang them. She was a pathetically humiliated sovereign; a ruin of a body; a ruin of State, destitute and disreputable. That the Amsterdam patricians were proud to receive her – a queen mother, a Medici – was typical of their character. But it was more than the character of Amsterdam’s patricians. The central government of the Republic in The Hague issued a directive stating that she should not be received at the country’s expense. Her presence in the Republic could endanger diplomatic relationships with France; after all Marie de’ Medici was incessantly plotting against Richelieu. That Amsterdam defied this directive was a downright act of defiance triggered by the city’s ruling regents being almost permanently at odds with the central government and the Stadtholders, as well as an assertion of civic pride and independence. As such Marie de’ Medici’s grand reception, without precedent since, for which no costs were spared (in all it cost the city 8000 guilders), contrasted sharply with the lukewarm reception that had befallen the Stadtholders Prince Maurits in 1618 and Prince Frederik Hendrik in 1628. 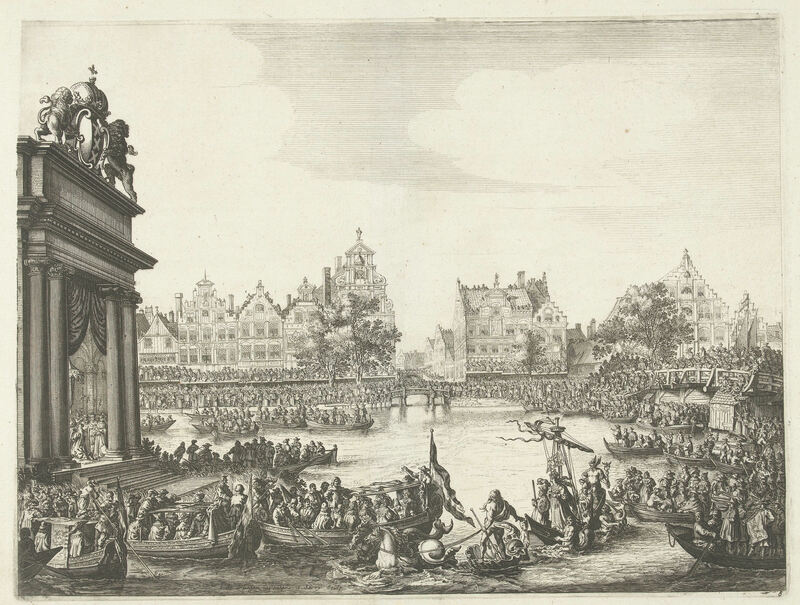 Marie de’ Medici’s visit to Amsterdam took place from 31 August to 5 September 1638 and the civic guards companies played a significant role in her ceremonial entrance to the city with a full complement of men taking part. It rained so hard that the Queen preferred to make her entry by carriage through Haarlemmerpoort rather than by boat as originally planned and consequently the civic guards, formed up beside the water, had to take up a new position along Nieuwendijk. On several locations in the city temporary triumphal arches with theatrical stages on top had been erected, designed by the painter Claes Moeyaert. On these improvised stages, tableaux vivants were enacted. It is telling that in none of these tableaux vivants the central government in The Hague or the House of Orange were honoured; instead, there were homages to the Kings of France, the Medici of Florence who were after all businessmen just as Amsterdam’s ruling regents and the Habsburg Emperors who had awarded their “imperial crown” to Amsterdam in 1489, as well as mythological scenes alluding to the French Queen’s status. This was not all: water pageants were staged in the harbour, there was a procession led by mounted trumpeters and a large temporary structure was erected on an artificial island in the Amstel River where more dramatic tableaux vivants were enacted once the Queen set foot on the floating island and entered its pavilion. A luxurious commemorative book with elaborate engravings and bound in handsome leather entitled Medicea Hospes (etc.) (1638/9) was commissioned from the scholar Caspar Barlaeus in both a Latin and a French edition, which Rembrandt must have known. And of course, if he was not a member of one of the civic guards companies taking part in the ceremony (proof of his membership has never been found) he must have been among the many spectators and perhaps, upon coming home, made sketches of the spectacle he had witnessed from memory. The festivities were a euphoric celebration of Amsterdam’s independence for which the old Queen, a descendant of the ruling bankers family of that other merchant city-state, Florence, was merely the catalyst. On her first evening in Amsterdam Marie de’ Medici was offered an Indonesian rice table by Burgomaster Albert Burgh. From him she bought the rosary that had belonged to Saint Francis Xavier, which had been captured in Brazil. Whether her portrait ascribed to Gerard van Honthorst was commissioned by Amsterdam’s burgomasters or by Marie herself is not clear (sources mention two portraits commissioned during her visit and it is not clear whether the portrait in the Amsterdam Museum is in fact Honthorst’s), but in it she proudly holds her purchase in her hand. Salomon Savery engraved a copy of the portrait for Barlaeus’ book and duly added the silhouette of Amsterdam in the background. 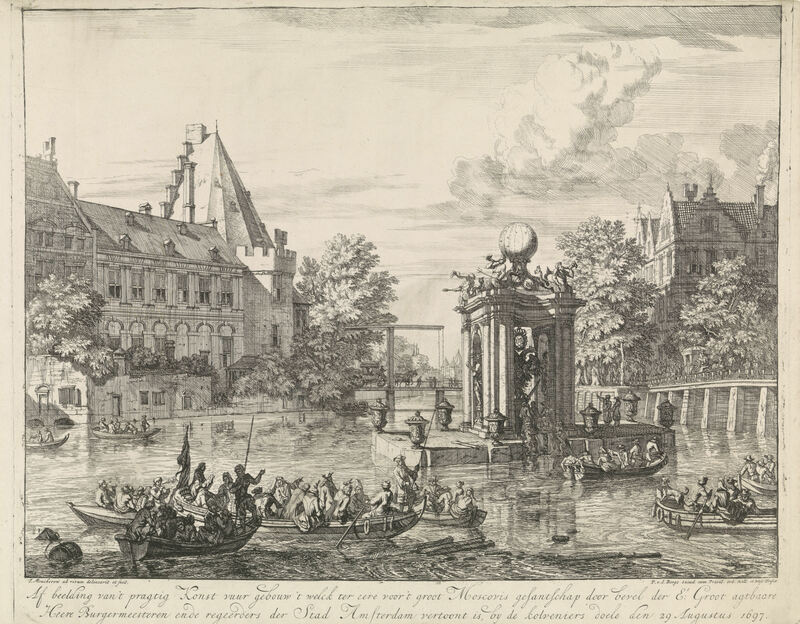 During her visit the Queen took her meals at the Amsterdam Admiralty and there is no evidence that she visited the Kloveniers‘ grand new building which overlooked the Amstel River at its widest point. Her entourage, however, was ceremoniously received in the Kloveniers’ Great Hall on the first floor which was hung with borrowed tapestries for the occasion. The large group portraits that would decorate the hall were all painted in the years immediately following Marie de’ Medici’s visit, a reason to assume that Marie de’ Medici’s visit and the completion of the Great Hall of the Kloveniersdoelen (which, as we have seen, was completed a decade earlier) were the immediate causes of the commissioning of no less than six militia company portraits and one Governors’ portrait for the room, among which Rembrandt’s Night Watch. 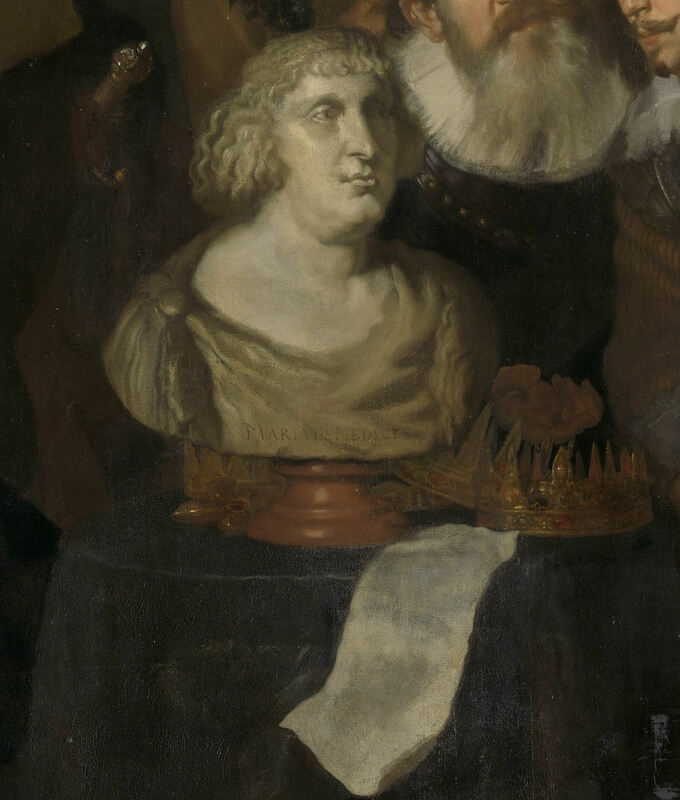 One portrait, the Company of District XIX commanded by Captain Cornelis Bicker by Joachim von Sandrart dating 1640, in fact contains a specific reference to the visit: the men’s focus of attention is a bust of Marie de’ Medici around which the company gather. In 1947 her prominence in the painting led Prof. Six to believe that her visit must have been the cause and the subject of the whole decorative scheme for the great hall, which is only partly true. The entry clearly relates to Sandrart’s painting although Evelyn does not say in which of three civic guards headquarters he saw it. The company of Cornelis Bicker originally belonged to the Crossbowmen civic guards but transferred to the Kloveniers at some unknown date, following a system of rotation that was a conscious attempt of the city’s magistrates to prevent the civic guards from establishing their own military and political power base in the city. An indication that the painting originally hung in the Crossbowmen’s building on the Singel is the discovery during its restoration in 1984 that it had originally been conceived as a horizontal painting. At some time it had been cut down on the left and the right and a strip of about 34 centimeters was added at the top. The civic guards on the sections that were cut off were simply painted in again on the part that was left and the composition was adapted to its new format so that it now fitted in its new home in the Kloveniers‘ Great Hall between the windows on the Amstel River side and the chimney. Sandrart’s painting was essentially the same height as Govert Flinck’s painting of the Company of District XVIII commanded by Captain Albert Bas of 1645 on the other side of the mantlepiece. The changes were not made by Sandrart himself and all the heads were retouched by the same unknown hand. It is likely that by the time the painting was altered Sandrart had left Amsterdam for good, which he did in about 1642, because although he does mention the painting in his Teutsche Academie of 1675, he says nothing about the drastic alterations. The Corporalship of the Lord of Swieten. Painted by Sandrart. Since no contemporary illustrations survive of the Great Hall of the Kloveniers as it was in the 1640s, one has to rely on eye-witness reports, however summarily, such as Schaep’s account of 1653 and ground plans giving the hall’s measurements on which a reconstruction could be based. 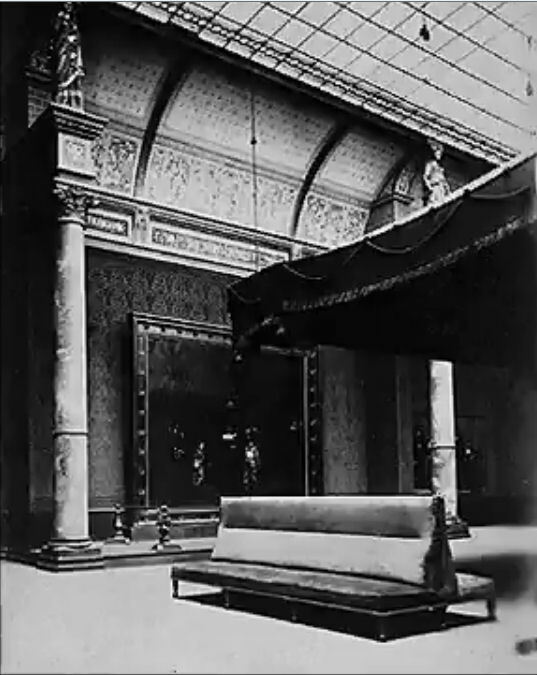 Originally the hall had windows on both sides, but at an unknown time, presumably to accommodate the three large paintings commissioned for it, the wall on the street side was boarded up. The placement of the paintings in the Great Hall was dictated by seniority (the year in which a company joined the Kloveniers) and was therefore fixed. Nevertheless the group portraits must have been conceived as a unified sequence of civic guards flowing from one painting to the next. 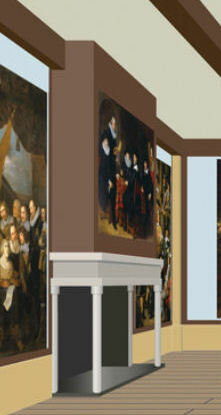 For instance, in Jacob Backer’s civic guards painting (3) the men stand on a flight of steps leading up to the guards in Bartholomeus van der Helst’s painting (4), which hung above the door and the fireplace while the building on the right in Pickenoy’s painting (2) continues into Jacob Backer’s work (3). It is known that Nicolaes Eliasz Pickenoy, Rembrandt’s neighbour on Breestraat, had a large enough studio to allow his civic guards paintings to be painted there so it is possible that Backer’s painting was also painted there. All three paintings (Pickenoy’s, Backer’s and Rembrandt’s) were finished in the same year, 1642, proof perhaps of a concerted unifying effort. But where Pickenoy and Backer, masterful as their paintings were, restricted themselves to the conventions of the traditional civic guards portrait in which all men are awarded the same attention (after all, each paid well to be included, expecting a reliable likeness), Rembrandt did something very different: in his Night Watch not the sitters but the action is the focus of attention and where other civic guards paintings are static, his is all about movement. Although the link between Marie de’ Medici’s visit and the Night Watch had been observed before by scholars, it was Snoep (1974) who suggested that the architectural structure seen in the background of the Night Watch, more clearly visible in Gerrit Lundens’ small contemporary copy of the painting, could be the outside of the theatre gate built on Varkenssluis as seen in the design drawing by Jan Martszen the Younger for an engraving by Salomon Savery. Another detail in the print, the balustrade beside the canal, also recurs in the painting. The idea has been rejected because Rembrandt did not copy the arch’s architecture literally, but when did he ever one might argue. He would interpret his print samples to suit his own purposes as he did his sketches of architectural structures. 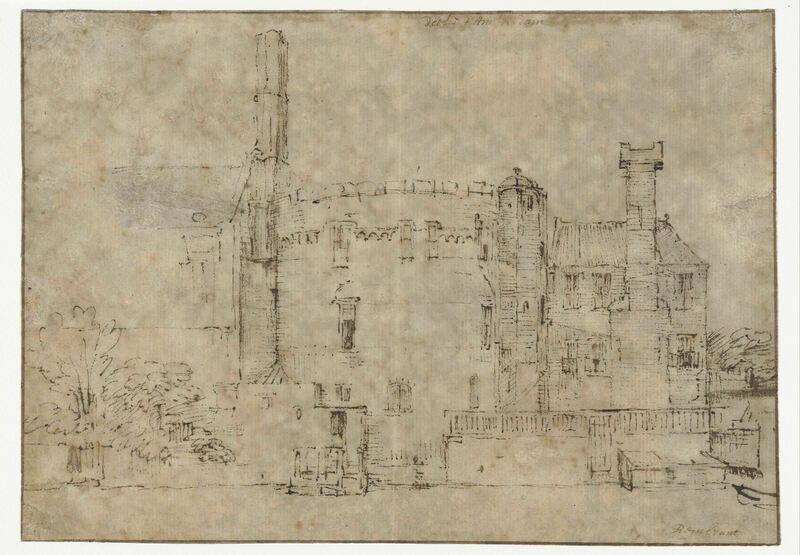 For instance, when he drew the Kloveniers building, he concentrated on the sturdy, plain medieval tower Swijgh Utrecht alone, which he perhaps envisaged as background for a history painting, also leaving out the tower’s pointed roof. 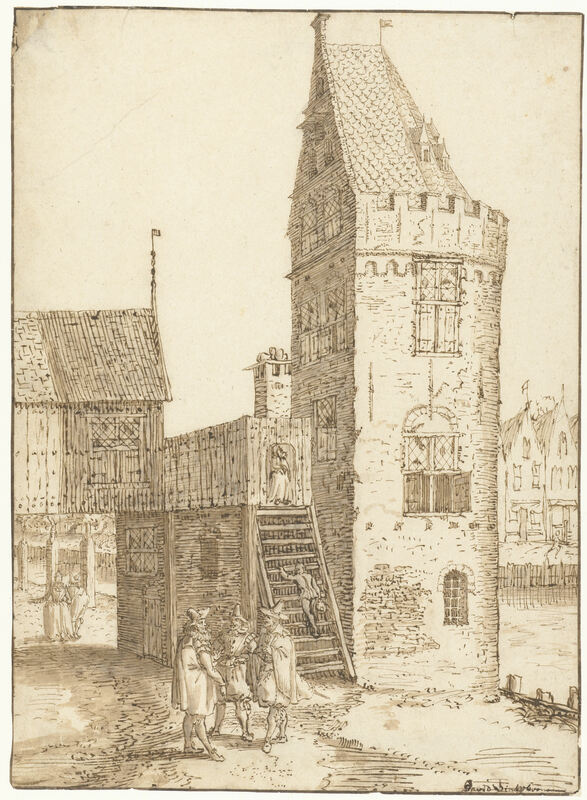 Although the Varkenssluis gate was not the theatre gate where Captain Banninck Cocq and his men were stationed (and at the time of the visit neither he nor his Lieutenant headed District II yet as in Rembrandt’s painting), that did not matter. It has been pointed out that the architectural structure in the Night Watch is not an actual gate because it does not allow light through it and, like the theatrical stage above the ceremonial gates in the engravings, it is enclosed at the back. Rembrandt thus combined both theatre and gate as one stage set against which he grouped his men. […] in the opinion of many he made the large picture too much a work executed according to his own wishes than one of individual portraits which he was commissioned to do. This work, no matter how much it can be censored, will survive all its competitors because it is so painter-like in thought, so dashing in movement, and so powerful that, according to some, all the other pieces there [in the Kloveniers’ headquarters] stand beside it like playing cards. One cannot put it much more eloquently than this. The painting’s indirect allusion to the pageants staged during Marie de’ Medici’s visit must have been implicitly understood by the Kloveniers and the other paintings in the Great Hall in their own way, painted so soon after the event, must have been understood in a similar vein. 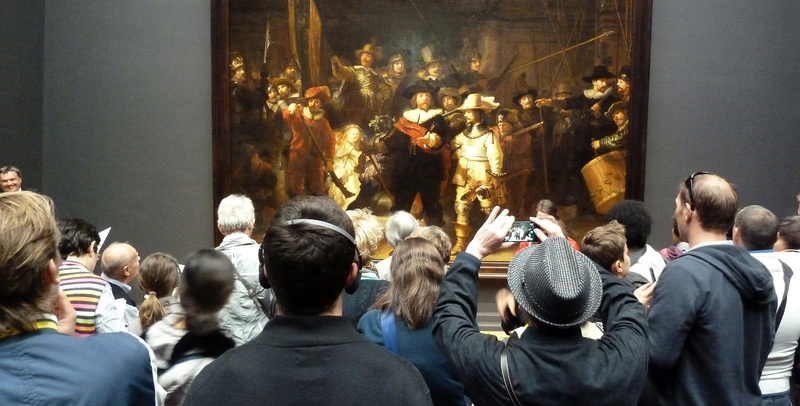 What Rembrandt’s Night Watch and the other civic guards paintings in the Kloveniers’ Great Hall have in common is an allusion, albeit an indirect one, to the French Queen’s visit to Amsterdam only a few years previously. No other painter ever followed Rembrandt’s revolutionary innovation, a concentration on movement and action rather than on individual portraiture, but there was a practical reason rather than an artistic one for this: with the great last blossoming of the genre which saw civic paintings the scale of which was unheard of at the time and never seen again in Dutch art, the civic guards headquarters’ walls were simply full. As a final irony, La Rouïna Madre, Marie de’ Medici, whose controversial visit indirectly triggered the last upsurge of Amsterdam’s great civic guards portraits, died in the same year in which Rembrandt’s masterpiece was completed: 1642. In the next post a more detailed discussion of the Night Watch, an encounter with some of the men portrayed in it and some disconcerting conclusions about what is left of it today.